Faculty members in the state-of-the art Guided Therapeutics (GTx) operating room, uniquely equipped with image-based surgical navigation technologies, and the largest operating room of its kind in Canada.The GTx OR integrates imaging and new technology to help deliver the most precise therapy possible, improving long-term outcomes, reducing the impact of surgery and offering hope to patients with complex disease. INTRODUCTION Otolaryngology is a medical specialty concerned with the diagnosis and surgical treatment of disorders and diseases of the head and neck regions. The anatomy of these regions represents one of the most complex systems in the body, with nerves, blood vessels and muscles tightly compacted in a limited space. Otolaryngology is therefore a highly specialized field that addresses a multitude of disorders spanning illness or injury of the ear, nose and throat, which includes hearing loss, congenital birth defects, voice loss, nose-related issues, airway emergencies, and many different types of cancers. Otolaryngologists also perform facial plastic and reconstructive surgery around the head, neck and skull base. The development of more precision-based technologies has allowed otolaryngologists to better serve patient needs. But there is still a growing need for more of these highly trained specialists in the Greater Toronto Area. Building capacity in this important field means attracting funding to bring the very best researchers and clinicians in the world to the University of Toronto. 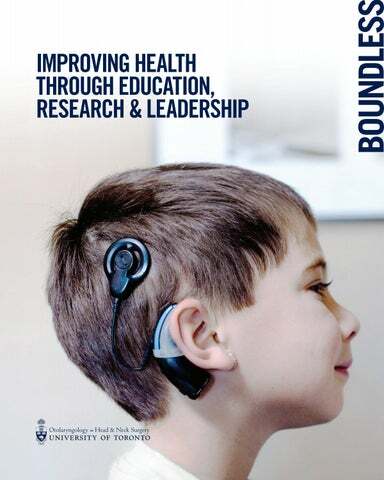 More funding will allow U of T to foster innovation and research excellence in otolaryngology; train and develop the next generation of clinicians and surgeon scientists; and share knowledge broadly to develop best practices to help advance the field. The result: new treatments and innovations, improved and advanced clinical care, and ultimately, better quality of life for patients in Canada and beyond. THE DEPARTMENT OF OTOLARYNGOLOGY — HEAD & NECK SURGERY The Department of Otolaryngology—Head & Neck Surgery at the University of Toronto’s Faculty of Medicine is the largest in Canada, and is ranked as one of the top five departments in North America. With 143 faculty members spread across 18 hospitals, the department represents the second busiest head and neck centre on the continent, and is an international leader in the discovery, innovation and implementation of the best practices, research, education and clinical care. Over the past 20 years, the department has grown in scope and breadth by establishing a significant international profile that attracts residents, fellows and faculty from all around the world. This is because the department is home to the largest training program of its kind in Canada, providing the most fellowships for programs for advanced sub-specialty training in the field. As a result, it has earned an international reputation as a top destination for training future leaders in head and neck surgery. As part of the University of Toronto’s Faculty of Medicine, the department is a hub for education, research and innovation that is fully affiliated with Toronto’s nine academic teaching hospitals. This unique position connects our clinician-scientists to the most up-to-date knowledge and research underway in Canada and beyond, and ensures patients have access to the most advanced clinical care in this field. Located within this environment, the department also acts as a fertile training ground for residents who are exposed to a broad range of cases, treatments and procedures. TEACHING AND RESEARCH WITH GLOBAL IMPACT The Department of Otolaryngology—Head & Neck Surgery is an international leader in the improvement of health through innovation and excellence in surgical practice, research and education. The department’s undergraduate and postgraduate programs offer students robust hands-on training while lectures from visiting clinician-researchers allow experts to share new knowledge in research, teaching and technology. For example, medical students are trained in the challenging clinical skill of otoscopy— the visual examination of the ear canal and ear drum— using the U of T-developed OtoSim™ which projects digital images of the ear drum at the back of an artificial ear. The depth and breadth of research excellence at the Department of Otolaryngology—Head & Neck Surgery is unmatched in Canada. Our researchers are conducting basic and translational research, as well as advanced technologies used in clinical care, including guided therapeutics and robotics. Our cancer research team is among the top five in the world, and is working to understand head and neck cancer biology at the molecular and cellular level in order to find new biomarkers for the diagnosis and monitoring of disease. Our faculty members are conducting research on the leading edge of inner ear and cochlear development with the goal of restoring hearing to those who have lost it. Departmental research is also leading to some groundbreaking discoveries in vestibular physiology— the inner ear balance system — such as the development of a helmet for people with balance problems to walk upright. Work is underway to miniaturize the helmet in order for it to be implantable. We are also leading research in voice and airway care, childhood illness, and nasal and sinus disease. Developed at U of T, the OtoSim™ allows examination of the ear canal and ear drum by projecting digital images of the ear drum at the back of a realistic earform. The technology is used in more than 100 teaching institutions worldwide. OTOLARYNGOLOGY AT THE UNIVERSITY OF TORONTO The Department of Otolaryngology—Head & Neck Surgery at U of T’s Faculty of Medicine is renowned for its research excellence, innovative approach to education and breadth and depth of clinical expertise: •	The department produces more peer-reviewed research papers each year than any other program in Canada. Many of our innovations are applied in Canada and around the world, including head and neck cancer treatments, methods to detect cancers early, novel methods to reconstruct the facial skeleton with tissue transplanted from other parts of the body and new methods to restore hearing. •	Faculty members are at the forefront of the most advanced clinical research, such as developing stem cell therapy to regenerate hair cells in the ear to combat hearing loss; performing minimally invasive head and neck surgery in which cancerous brain tumours can be removed through the nostrils; removing miniscule tumours visible only via CT scan images; performing robotic surgery to remove throat cancers; and leading the practice of cochlear implantation in children and adults. •	Faculty members have received five Mosher awards since 1964 (the most prestigious research award in the field within North America); more than any other department in North America. •	The undergraduate and postgraduate curriculum has become a model for other Canadian medical schools. •	The department trains the most fellows in Canada. This past year, there were 17 fellows ranging from head and neck surgeons, oncologists and cochlear implant specialists to researchers working on a myriad of translational research projects. There were 26 residents in the department this year. •	Our location in Toronto — one of the world’s most diverse cities, and Canada’s largest — means we have access to an expansive and varied patient population, enabling trainees and specialists to treat rare and challenging cases as well as common day-to-day ones. Located in Toronto, one of the world’s most diverse cities, the Department of Otolaryngology—Head & Neck Surgery can take advantage of U of T’s FullyAffiliated Hospitals/Research Institutes. Toronto has one single medical school, world-class teaching hospitals, excellent technological infrastructure, huge strengths in computational research, broad and deep health data sets, a history of cross-disciplinary collaboration, a remarkably diverse population and leading expertise in health policy and management— all in the context of a single-payer health system. While other cities may share some of these attributes, only in Toronto are all of these strengths combined in one place. With additional partners, such as the Institute for the Advancement of Technology for Health (Techna), MaRS and the Centre for Commercialization of Regenerative Medicine (CCRM) in our network, we are uniquely positioned to commercialize and translate research into practice. In terms of output, we rank second only to Harvard University in health and biomedical science publications. FUNDING OPPORTUNITIES The Department of Otolaryngology—Head & Neck Surgery not only trains tomorrow’s leaders, it also ensures that all hospitals get access to the latest research, and the very best and most advanced clinical care. Funding in the following areas will help attract and retain the best researchers and trainees, while improving and enhancing knowledge sharing, and developing best practices in otolaryngology. FACULTY SUPPORT Securing top leadership as well as early-career researchers is an integral part of building capacity at the Department of Otolaryngology—Head & Neck Surgery. mid-career and young faculty members as well as post-doctoral fellows, graduate students and undergraduates to assist with the critical research function of the department. A Chair in Otolaryngology—Head & Neck Surgery will be named in perpetuity, representing an enduring legacy of intellectual excellence, impact, influence and recognition. An endowed chair in Head & Neck Surgery will create increased capacity to support clinician scientists (spending two to three days per week in the lab) and full-time basic and translational (“bench to bedside”) scientists. 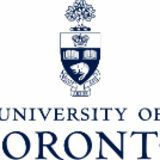 Endowed chairs at the University of Toronto are among the most important and prestigious academic appointments in Canada. Endowed chairs allow the University to provide competitive compensation to internationally recognized scholars and researchers who might otherwise accept positions at other universities. There is also an option to fund the Chair on a expendable basis, over a five-year term. Early Career Professorships As new graduates complete their training and become faculty members, they are in critical need of support. Early Career Professorships allow us to attract the most promising clinicians and researchers who will be part of the next generation of outstanding U of T faculty. Hearing loss due to a disease threatened my quality of life, but thanks to innovative otolaryngology surgery and advanced hearing aid technology, my hearing was restored. Rose Allison, patient treated for otosclerosis by faculty in the Department of Otolaryngology—Head & Neck Surgery. To secure the future of the Department of Otolaryngology— Head & Neck Surgery, critical support needs to be directed to attract outstanding students with the potential and ambition required to undertake careers in research and academic medicine. The excellence of our education program is dependent on the engagement and effectiveness of our teachers. There is also a significant opportunity to enhance our teaching capacity by attracting visiting lecturers to share knowledge, organize symposia and lectures to disseminate findings, and provide greater opportunities to develop best practices in otolaryngology research and patient care. Clinician-Scientist Training Program The Clinician–Scientist Training Program provides clinicians with the tools necessary to function in the future as independent scientists in the field of otolaryngology. The program is designed to provide graduate research training at the Master’s and PhD levels. Graduates of the program become clinician-scientists who occupy senior academic medical positions at universities and hospitals nationally and internationally. While the clinician-scientist track is one of Medicine’s most rewarding career paths, lengthy training and the associated debt load, coupled with uncertain research funding, threatens to limit the number of students who are able to choose this option. Funding the ClinicianScientist Training Program will reduce these obstacles and encourage more outstanding students to seek careers in medicine and academic research, in the field of Otolaryngology—Head & Neck Surgery. There is an opportunity to bring distinguished individuals who are global leaders and making outstanding contributions in the field of the Otolaryngology—Head & Neck Surgery to lecture at U of T. There are also opportunities to organize symposia, lectureships, conferences and other events that support knowledge sharing and transfer. We will be delighted to work with donors to recognize their generosity appropriately and to inspire others in the community. Options include naming of the chairs, professorships and scholarships in accordance with University policy, as well as lectureships and symposia. The Department of Otolaryngology—Head & Neck Surgery is committed to keeping our donor community informed and engaged regarding research progress and events. CONCLUSION The Department of Otolaryngologyâ&#x20AC;&#x201D;Head & Neck Surgery at the Faculty of Medicine is preparing specialized surgical leaders, contributing to our communities and improving the health of individuals and populations locally and globally through the discovery, application and communication of knowledge. With support, we can advance this mission and meet the needs of our constantly evolving profession. Funds raised for the Department of Otolaryngology—Head & Neck Surgery contribute to the Faculty of Medicine’s $500 million fundraising goal, a cornerstone of the University of Toronto’s unprecedented $2 billion Boundless campaign. U of T Medicine’s campaign is the largest fundraising initiative for a Faculty of Medicine in Canadian history, helping to educate our future health care leaders and advance groundbreaking research that will improve health in Canada and around the world.